I honestly can’t think of a better way to begin the week than by celebrating the Obamas. They may not be in the White House any longer, but that doesn’t mean they cannot continue to reign supreme in their day-to-day lives. Take, for instance, the fact that their greatness was celebrated on a Monday, a notoriously tough day because it’s the beginning of the workweek. 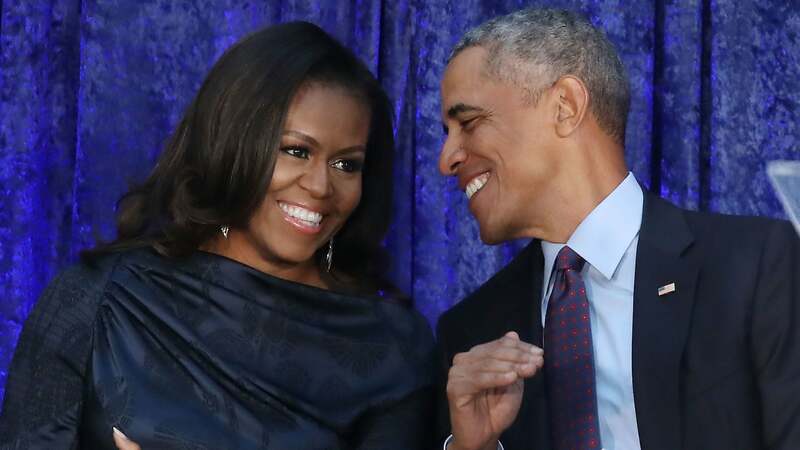 The only thing that could cure my case of the Mondays (especially on the dreaded week of Valentine’s Day) was the fact that the Smithsonian National Portrait Gallery unveiled their new portraits of Barack and Michelle Obama. Barack’s portrait, which shows the former president sitting on a wooden chair surrounded by lush, exotic florals (including Chicago’s unofficial flower, the chrysanthemum and a flower pointing in the direction of Hawaii, Obama’s birthplace), was done by celebrated artist Kehinde Wiley, while Michelle’s portrait, which depicts her looking regal in a black and white gown with splash of hot pink, yellow and red in front of a sky-blue backdrop, was done by Amy Sherald. The portraits are, in a word, stunning. While at the unveiling ceremony, People magazine reported that Michelle seemed very happy with her portrait, remarking that she felt “overwhelmed, humbled, proud and grateful” upon seeing it. Michelle also recalled her first meeting with Sherald, who seemed so excited to meet the former first lady. Before departing, “[Sherald] physically turned to me and said, ‘I’m really hoping we can work together,’” Michelle recalled during her remarks. “After that, she and I started talking and Barack kind of faded into the woodwork,” she continued, noting that she and Sherald instantly had a “sista-girl connection” as they began to work more closely together. The portraits are so, so stunning and are (to our knowledge, at least) the second pair of official portraits that the Obamas have had made for them, far brighter and more fun and representative of their spirit than those stuffy White House portraits. It’s so nice that we get to have yet another way to celebrate the Obamas. With some fine (emphasis on fine) art.